meiadeleite.com » sweetness is superficial! 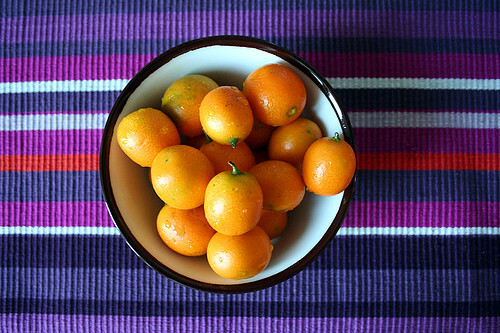 i had never heard of kumquats before coming to china – and the reason i picked them up in the supermarket was because i mistaken them with little oranges. but as soon as i got home and started pealing one, i knew these little guys were no ordinary citrus. so i waited for my chinese lesson to ask the teacher about them. it turns out, you can eat just the peal, which is sweet, or eat them whole, by chewing chewing chewing (this instructive video shows how to eat a kumquat). the inside is unexpectedly tart for those of us expecting mini-oranges (but not too tart), so you really need to chew a bit to get the flavours mixed and get the best combination.